We’ve just released Alpha 16.4 Patch. Which includes many of the most important bugs reported by the community. Please report any issues in the Alpha 16.4 Stable Bug Report forum thread. Official Alpha 16.4 Release Notes! Put fix in place to skip corrupt sleeper volume savegame data. Solar cells won't show on trader refresh. Red Mesa elevator shaft stability fix and other improvements. Land Claim does not prevent placement of minibike chassis. Savegame Crash: EndOfStreamException: Failed to read past end of stream. Last edited by Hated; 10-28-2017 at 01:49 PM. Funny, Steam doesn't have it yet. I'm assuming it's b8, that's why I posted that bug report. (QA Tester unholyjoe) - yes stable is a16.4b8 build so steam will not show anything different other then experimental is probably closed now. Last edited by unholyjoe; 10-27-2017 at 11:21 AM. Last edited by Alpacko; 10-27-2017 at 03:49 AM. I just restarted Steam. There's no 16.4 on the beta yet, and "latest_experimental" hasn't updated. Couldn't you just have said what version you have? Unable to lock or password vault doors, possibly other doors too. Summary: Vault Doors (possibly other doors as well) not showing lock/password options. When holding "E", they just open and close and make your door useless because you can't lock it or password protect it. Damaging the door does not fix this. Upgrading the door does not fix this. Replacing the door with a new one does not fix this. Logging in and out does not fix this. Did you validate your files? Server is vanilla running validated files. Status: Found in A16.3 b12, may have been present before, and is still present in a16.4 stable. Bug Description: Vault Doors (possibly other doors as well) not showing lock/password options. When holding "E", they just open and close and make your door useless because you can't lock it or password protect it. Damaging the door does not fix this. Upgrading the door does not fix this. Replacing the door with a new one does not fix this. Logging in and out does not fix this. Reproduce steps: Watch the video linked below. Build something similar and see if around 2% of your doors have this bug like I have found. Of approximately 100 doors, 2 exhibited this failure. FWIW, the doors have fully upgraded steel spikes underneath them, but they all do, so while this is an unusual build layout, I doubt the spikes are a factor, since 98 of the doors function just fine. Actual result: (description of what is occurring) Of around 100 vault doors, 2 fail to offer the lock/password options when holding the "E" key. Expected result: (what you expect to occur) They should ALL offer this option, otherwise the door is useless and must be left unlocked. ALSO, as demonstrated in this video, SP testing showed that every single upper door failed. Repro is easy, if you place doors/hatches and such directly above each other, the upper ones will not have the lock option. To prevent this right now in your construction place the upper row doors first. Last edited by schwanz9000; 10-27-2017 at 12:11 PM. you should have no problem if you had none using the experimental. if you were using another build then its best to so you can give accurate reports. Last edited by unholyjoe; 10-27-2017 at 11:25 AM. If you just want to play no, but if you want to submit an accurate and complete bug report it is always required to start fresh with a new install and clean out all old folders and files. But for leisure play you can try to get away with not wiping out everything. TFP are not interested in compatibility bugs with older saves, just fresh new installs with the current working stable. files validated. and mod redownloaded. Looked around the local town but no zombies, ran back to base and fell through the map, hit a 0hp tree and kept giving me wood, multiplying with each hit with also a good chunk of experience with each hit. Bloodmoon night and no zombies come. Last edited by schwanz9000; 10-27-2017 at 12:15 PM. Bug Description: Snow isn't covering the road leaving uncovered sections. Snow should cover the road since roads sections adjoining have snow. Reproduce steps: Go to coordinates below, it is snow biome, head over there to check it out. At the time it was snowing but shouldn't matter. Edit: yes it is important that it is snowing. Actual result: Snow isn't covering angled roads. As per screenshot even the snow at an angle looks like dirt, dark brown, that should also be white like the rest of the ground but isn't due to being at an angle. Expected result: Snow to cover roads at angles similar to that of flat roads. 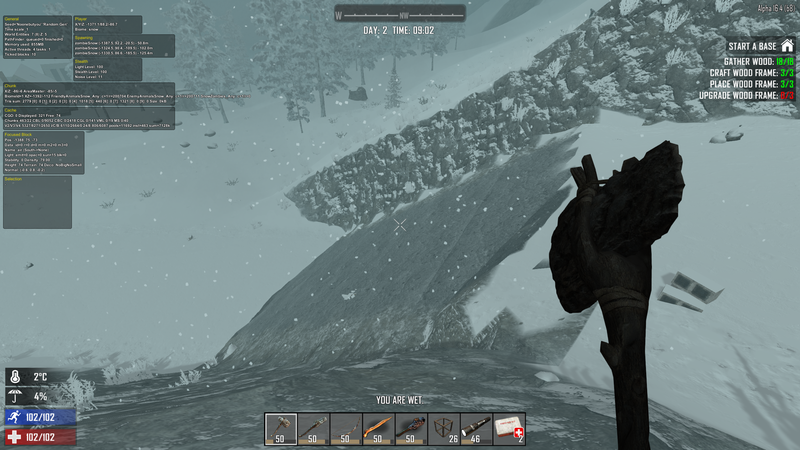 Not being covered in snow makes it appear a different biome from a distance and my character was trying to get warmer. Also, while not as steep as some roads in previous versions, the road shouldn't be as steep as 45-degree as the RWG is trying to make the junctions meet up but not at a uniform angle for the length of the road and elevation. Last edited by SMiThaYe; 10-27-2017 at 07:45 AM. What is by the way in my eyes a bug/issue. Why is the actuall stable version not choosable as a locked version. The way it is soo many players get their savegame destroyed because of a (from their sight) ninja patch. The actual stable _can_ be locked up. It was just not available yet, and I bet the delay was Steam's. But, here, it's not a day yet and 16.4 is there already, as 16.3 was there before. Last edited by Royal Deluxe; 10-27-2017 at 10:51 AM. When Blade Trap gets destroyed it still plays sound.